A frequent critique of choropleth maps is that, in the process of choosing color bins, one can hide substantial variation within each of the bins . An example of this is in this critique of a map in the Bad maps thread on the GIS stackexchange site. In particular, Laurent argues that the classification scheme (in that example map) is misleading because China’s population (1.3 billion) and Indonesia’s population (0.2 billion) are within the same color bin although they have noteworthy differences in their population. I think it is a reasonable note, and such a difference would be noteworthy in a number of contexts. One possible solution to this problem is by utilizing 3d choropleth maps, where the height of the bar maps to a quantitative value. 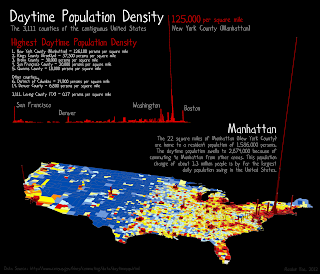 An example use of this can be found at Alasdair Rae’s blog, Daytime Population in the United States. The use of 3d allows one to see the dramatic difference in daytime population estimates between the cities (mainly on the east coast). Whereas a 2d map relying on a legend can’t really demonstrate the dramatic magnitude of differences between legend items like that. I’m not saying a 3d map like this is always the best way to go. Frequent critiques are that the bars will hide/obstruct data. Also it is very difficult to really evaluate where the bars lie on the height dimension. For an example of what I am talking about, see the screen shot used for this demonstration, A Historical Snapshot of US Birth Trends, from ge.com (taken from the infosthetics blog). If you took the colors away, would you be able to tell that Virginia is below average? Still, I think used sparingly and to demonstrate dramatic differences they can be used effectively. I give a few more examples and/or reading to those interested below. Ratti, Carlo, Stanislav Sobolevsky, Francesco Calabrese, Clio Andris, Jonathan Reades, Mauro Martino, Rob Claxton & Steven H. Strogatz. (2010) Redrawing the map of Great Britain from a Network of Human Interactions. PLoS ONE 5(12). Article is open access from link. This paper is an example of using 3d arcs for visualization. Stewart, James & Patrick J. Kennelly. 2010. Illuminated choropleth maps. Annals of the Association of American Geographers 100(3): 513-534. Here is a public PDF by one of the same authors demonstrating the concept. This paper gives an example of using 3d choropleth maps, and in particular is a useful way to utilize a 3d shadow effect that slightly enhances distinguishing differences between two adjacent polygons. This doesn’t technique doesn’t really map height to a continuous variable though, just uses shading to distinguish between adjacent polygons. GIS Stackexchange question – When is a 3D Visualisation in GIS Useful? A cool example of utilizing 3d in kml maps on the GIS site by dobrou, Best practices for visualizing speed. Alasdair Rae’s blog has several examples of 3d maps besides the one I linked to here, and I believe he was somehow involved in making the maps associated with this Centre for Cities short clip (that includes 3d maps). If you have any other examples where you thought the use of 3d maps (or other visualizations) was useful/compelling let me know in the comments. Edit: I see looking at some of my search traffic that this blog post is pretty high up for “3d choropleth” on a google image search already. I suspect that may mean I am using some not-well adopted terminology, although I don’t know what else to call these types of maps. The thematic mapping blog calls them prism maps (and is another place for good examples). Also see the comment by Jon Peltier for that post, and the subsequent linked blog post by the guys at Axis maps (whose work I really respect), Virtual Globes are a seriously bad idea for thematic mapping. Edit2: I came across another example, very similar to Alasdair Rae’s map produced by the New York Times, Where America Lives. Below is a screen shot (at the link they have an interactive map). Referred to by the folks at OCSI, and they call this type of map a “Spike Map”.